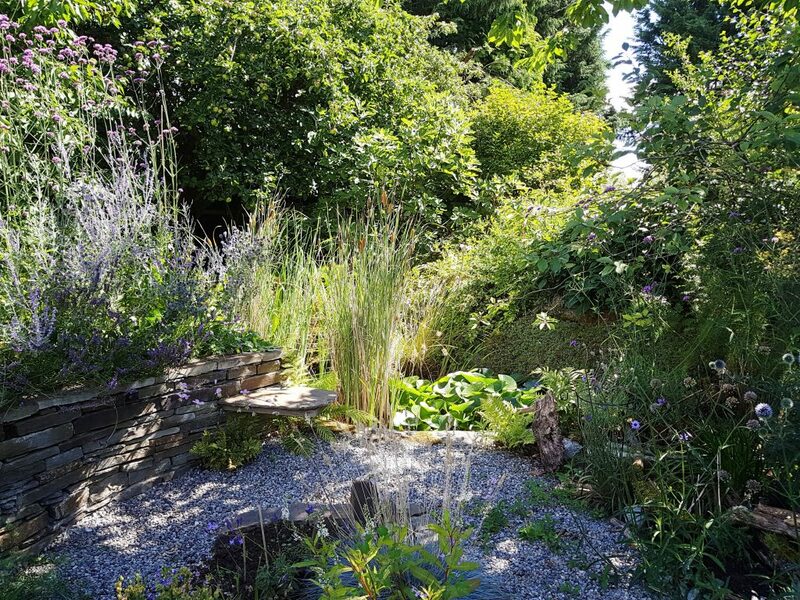 Designed and created by the owner in 2009 and made up of a courtyard garden, a stream supporting wildlife, small orchard, enclosed vegetable garden, pond garden, border beds and an open native woodland with water. The woodland planting started 4 years ago with Irish native trees of which some are ICUN Red Listed. The Sorbus hibernica is vulnerable, Sorbus devonensis is vulnerable and Sorbus angelica is near threatened. These will provide a seed source for the future. The Hazel, Cob Nut and Oak provide food for red squirrels and wild flowers provide for a beehive and other insects which in turn provide food for the birds. The garden is designed with climate change in mind, is low maintenance and easily adapted to any domestic situation. Also, to encourage the planting of trees whether large, medium or small and pollinator and insect friendly plants for all gardens. All plants are easily obtainable. Unlike some gardens open to the public this is a garden that everyone can relate to due to its size and intimate detail. There is something for everybody whether they are plantspersons or naturalists or designers. Admission Fees: €5 per person. No group discount. School Groups by arrangement. Facilities: Not wheelchair accessible. Find us opposite the side door of the Arthouse, Stradbally. Children: Children are welcome butMUST be closely supervised at all times..